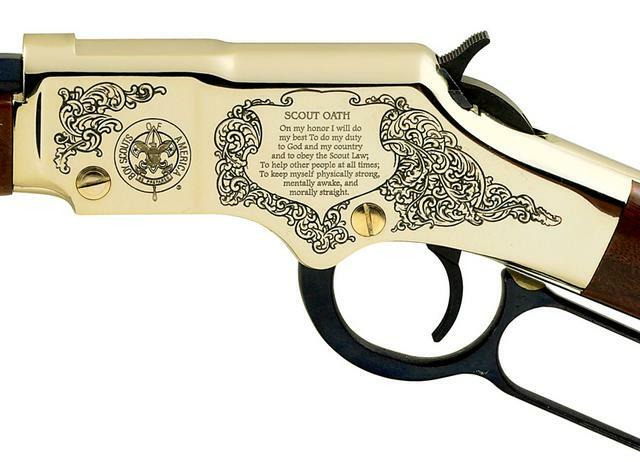 In honor of the Boy Scouts of America's 100th Anniversary, the Henry Repeating Arms Company produced this Centennial Edition rifle. 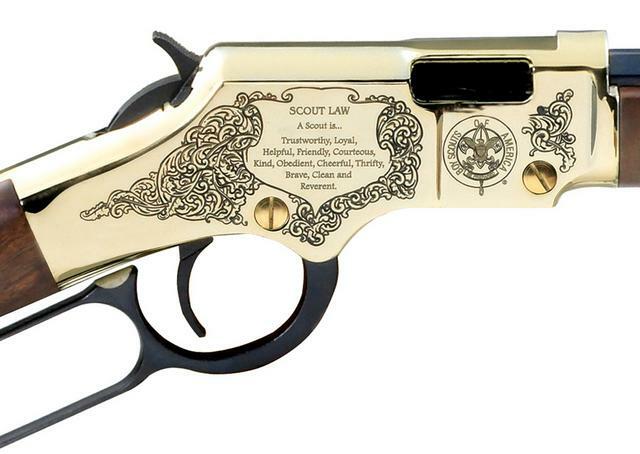 The brass receiver is finely engraved with the BSA Emblem, Scout Oath, and Scout Law. 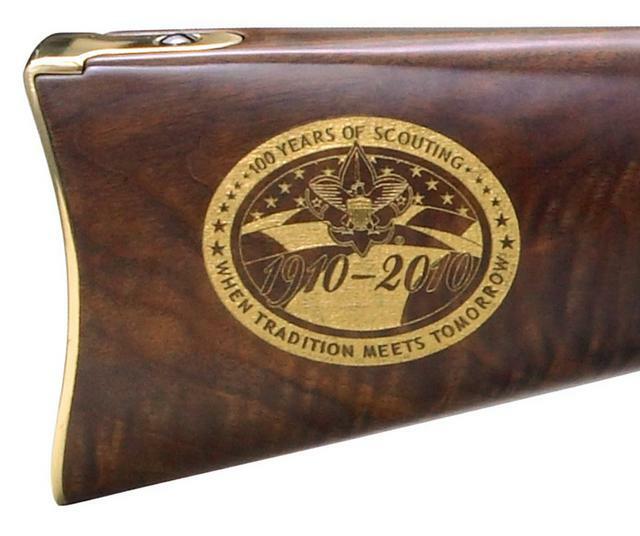 Gold filled etchings of the 100 Years of Scouting logo and Centennial Edition can be seen on the American Walnut buttstock and forearm. 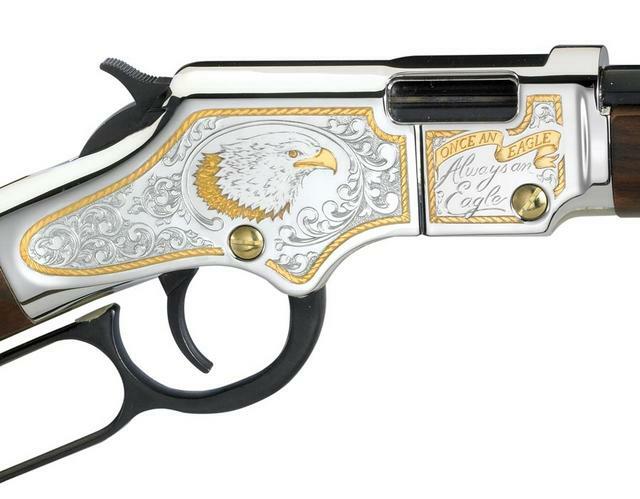 To honor excellency as represented by the young men who have earned Scouting's highest rank, Henry Repeating Arms Company introduced a special Golden Boy, Eagle Scout Edition. The left side of the nickel-plated receiver is hand engraved with the Eagle Scout medal flanked by banners with "Boy Scouts of America" and "Eagle Scout." The head of an American Eagle is featured on the right side along with the phrase "Once an Eagle, Always and Eagle." The details and borders are highlighted by 24-karat gold plating. 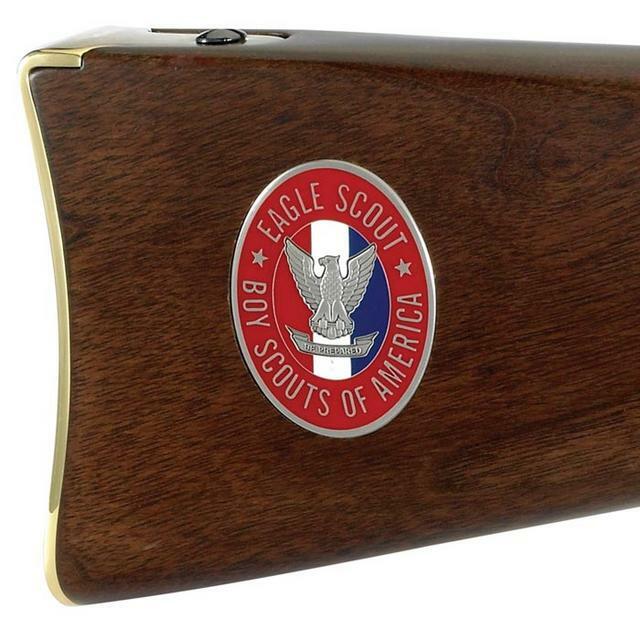 A red, white and blue Eagle Scout Badge medallion is inserted into the right side of the American Walnut stock. The forearm bears the six badges of advancement earned by the Eagle Scout and "Trail to Eagle" painted in gold fill. In 2007, Henry Repeating Arms Company created three Special Edition Commemorative Venturing Rifles to mark the 10th Anniversary of the BSA's Venturing program for young adults. 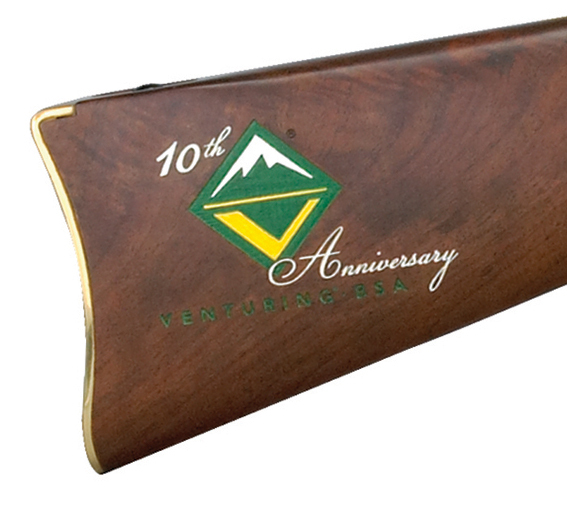 The Lever Action, Venturing Edition displays the 10th Anniversary Venturing logo with 24-karat gold plating on the right side of the dark receiver. 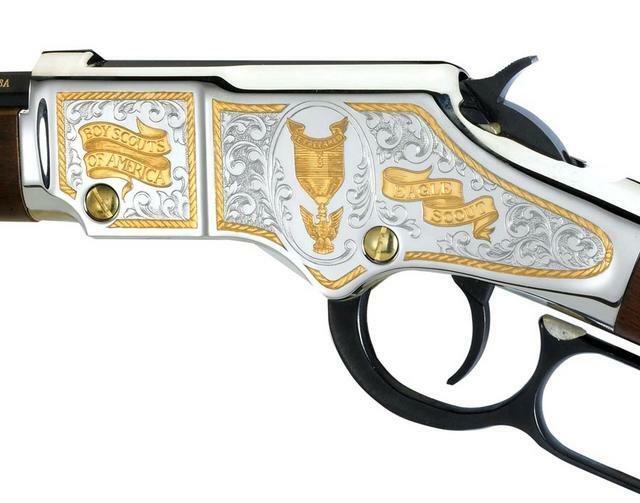 The American Walnut buttstock of the Golden Boy, Venturing Edition, features a laser etched and hand painted 10th Anniversary Venturing logo. The Big Boy, Venturing Edition, has an octagon barrel. 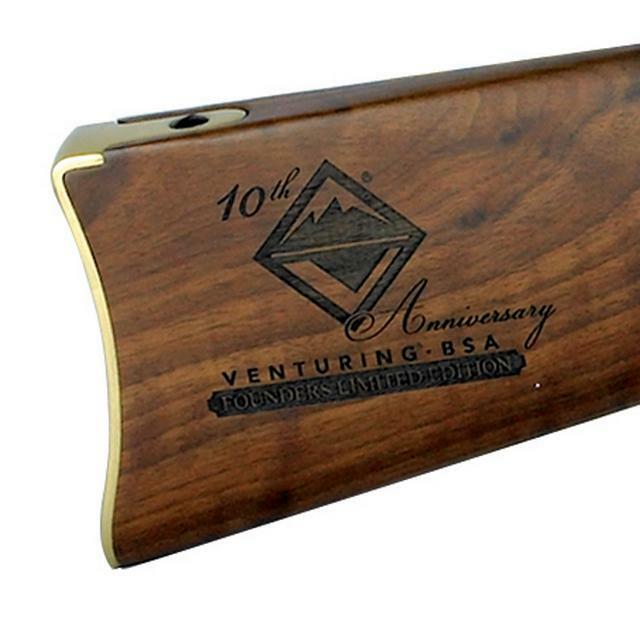 The 10th Anniversary Venturing logo is laser etched into the buttstock and then enhanced with black filling. The Daisy BSA Model 1910 has a molded stock and forearm with checkering and smooth bore steel barrel. It features and adjustable rear sight, blade and ramp front sight, and crossbolt trigger block safety. The maximum shooting distance is 211 yards with a maximum velocity of 350fps (BB).